By Zack Quaintance — While the focus has decidedly turned to year-end Best Of lists, we’d like to take a not-so brief look back at some of the best comics of December as well. The holidays are a busy time, wherein I know my own ability to read comics drops somewhat. Still! There was some excellent work being done in the last month of the year. And that’s what we’re here to look at today. So, let’s get to it! It’s always nice when what are arguably the two flagship titles for Marvel and DC are on point, and that’s certainly what we got this month with Amazing Spider-Man #11 and Batman #60. Great individual issues within runs I enjoy. In other Big 2 news, our sites personal favorite Marvel and DC books right now also had a strong month with Immortal Hulk #10 (what did we do to deserve this comic?) and Superman #6 (how is Bendis getting this run so right?). There was a reason these two ended up near the top of our Best Comics of 2018. Phew, okay. Now that we have Big 2 business out of the way (for this section, more to come…), we can get to our favorite indie top comics of 2018, starting with Bitter Root #2. Murder Falcon #3 is a book about metal and mourning that hits many of the same notes (sorry!) as this series first two issues...but it’s also so stylish, assured, and well-executed that those notes are still very powerful. We have the writing duo of Zac Thompson and Lonnie Nadler as creators to watch in 2019, and a big part of the reason why is super smart creator-owned work. In December, they wrapped up one such series with Her Infernal Descent #5, a sad story of family and mourning and a tenacious mom mashed up with Dante’s Inferno. Highly recommend getting this one in trade. This was a great year for upstart publisher Vault Comics, and they finished it out in pretty epic fashion, wrapping up two of their best series via Deep Roots #5 and Submerged #4. We’ve written a whole lot about both books, and you can find more on our Reviews Page. Last but certainly not least is Mars Attacks #3 from the hilarious creative team of Kyle Starks and Chris Schweizer. This book has the duo’s trademark humor, as well as a really tight survival narrative used for wide-ranging satire on modern America. Great stuff. I’ve been reading a lot of Aquaman lately, namely returning to Geoff Johns’ New 52 run on the character before continuing on to the Jeff Parker and Dan Abnett runs that bridged that one and Rebirth. And you know what? I think for the first time since Johns revitalized the character, I can say that this book is doing something drastically new. There are no Atlantean Game of Thrones plots and no caught between two worlds conflicts. What writer Kelly Sue DeConnick and artist Robson Rocha seemed more interested in is an ethereal take on the character that speaks to his status as an almost elemental force within the sea...I think. It’s a little hard to tell after one incredibly intriguing issue. I am, to use a fishing pun (I know I’m a bad person), thoroughly hooked on what they’re doing. I also think that Rocha, who I’ve long felt is underrated, did his sharpest work yet on this opening issue. Overall, I can’t wait to see where all of this goes from here, and if the first issue is any indication, it will be filled with surprises. Our number four overall choice for best comics of December 2018 is X-Men: Red #11, the finale to what has been the single best X-Men team book in a good number of years. We’ve written about this quite a bit (most recently in our Best Comics of 2018 feature...that again! ), so we won’t go into our usual talking points about how Jean is a natural leader, the threats update the metaphor for 2018, the whole deal feels organized and rejuvenated, etc. Instead, we’ll hone in on this one issue, noting that while the book seems to have ended a bit sooner than is ideal (writer Tom Taylor said on Twitter that he could have written it for years), the creative team really gave its all in putting together a finale that A. felt exciting, and B. spoke to the themes and concerns that had made this book so interesting throughout its run. It also did a great job incorporating much of the broader Marvel universe, which is always welcome but rarely easy for X-Men titles. RIP. The Marvel Knights 20th Anniversary six-part mini-series has been strong so far, launching with an intriguing mystery (amnesia! sort of) as its premise, and giving a host of talented writers and artists (many of which are rising stars) a chance to kick interesting ideas around while also playing with beloved characters. This fourth issue, however, ranks so far as the standout. Written by Vita Ayala (with Donny Cates getting a story credit) and illustrated by Joshua Cassara, this story is a surprisingly one about family, oppression, and what it takes to be not so much a hero as a net force for good when faced with injustice and impossible odds. 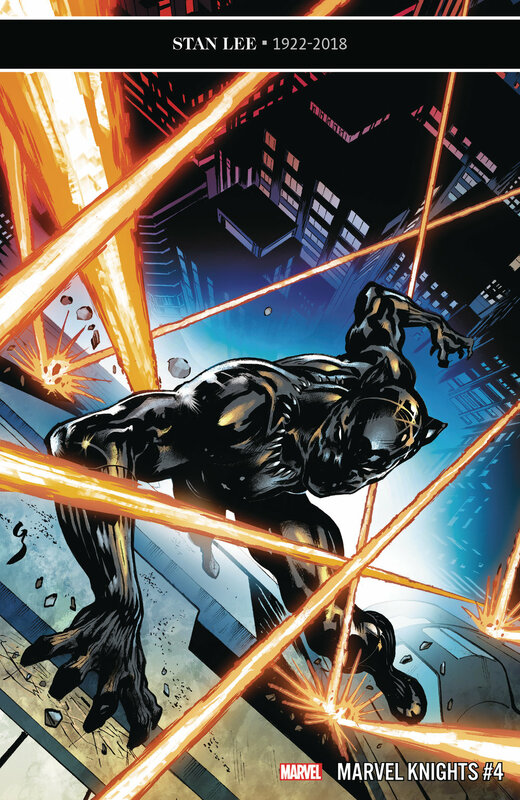 I absolutely loved this story, which even in an alternate reality did a wonderful job of humanizing T’Challa, long one of the most difficult characters to do that with in all of Marvel Comics. The story worked hard to give all the character’s choices weight (a great tool to yield poignant results in any narrative situation) while not sugarcoating the oppressive situation a semi-memory wiped T’Challa was facing as a black man without identification going about his business (or trying to) in New York. Matthew Erman and Lisa Sterle’s gorgeous and disquieting story of two sisters returning to a disenfranchised hometown beset by dangerous magic is, sadly, approaching its end. Long Lost Book 2 #5 is the penultimate issue, and in it, the creators stop understating their story and let loose with incredible visual flourishes. Lisa Sterle (another rising star if ever there was one) really shines in this issue, literally covering the skies at times with psychedelic horror that doesn’t draw from any established tropes I’ve ever seen to unsettle the audience. Moreover, I appreciate that this story wisely left so many questions unanswered. As I wrote in my review of Long Lost Part 2 #5, this story speaks to a lot of what people of my generation (ages 25 to 40 or so) are going through in this political moment, especially those of us who have left rural or suburban hometowns to proliferate in urban centers. In short, we cannot shake our ties to our pasts, even if when we try to return to them what we find feels unfamiliar and ugly. This story captures all of that beautifully, and I can’t wait to buy it for my friends and family in collected editions. This story took a little while to get going (made worse by the delays), but now that the action has begun in earnest, hoo boy is this a doozy. Perhaps most surprisingly, it also seems like it may be poised to live up to the incredibly lofty aspirations writer Geoff Johns set for it by using Alan Moore and Dave Gibbons’ Watchmen characters (despite the creators publicly not wanting DC to revisit the IP they created for the company). While I don’t feel great about that disregard of Moore and Gibbons’ wishes, if I’m independently evaluating this story, I like it quite a bit. It’s not entirely clear what it’s about just yet. This narrative, however, has become compelling and tense, using DC’s iconic superheroes to depict the vast complications of current global politics, which has become beset by a rise in authoritarian governments that rely on misguided populism. In this issue of Doomsday Clock, we see the Man of Steel himself brush up against some of those forces, being forced publicly by Vladimir Putin to take a basically take a side as Batman, listening from a Bat-Plane via radio or something, growls...Don’t take a side! It’s powerful stuff, and it seems poised to be even more provocative moving forward.